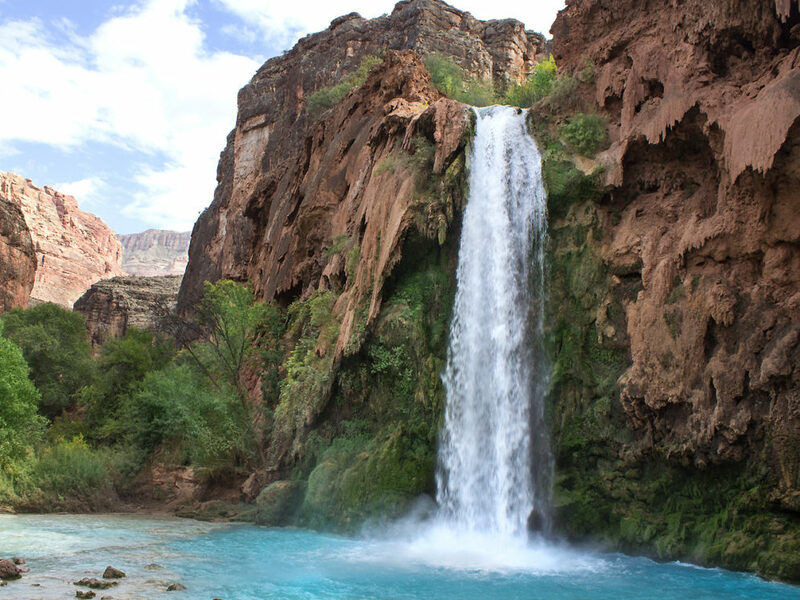 Spectacular, 100′ high Havasu Falls is a bucket-list worthy destination! Its icy, turquoise blue waters thunder through a remote dessert canyon. Here, big horn sheep graze beside a spring-fed creek. And endless cascades form a magical oasis. A stunning contrast to the soaring canyon walls around them. 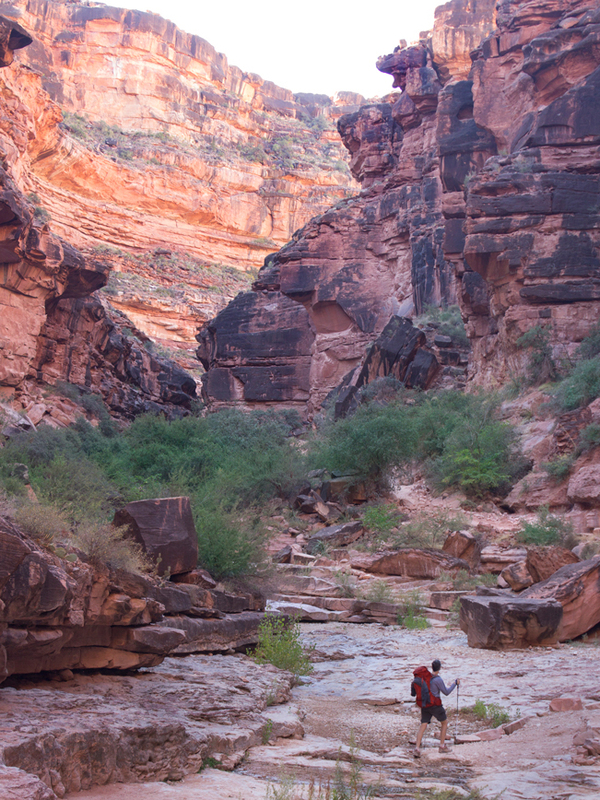 This hidden land has been the sacred home of the Havasupai Tribe for as long as time can tell. And it’s with the tribe’s permission only that visitors are allowed to share in the beauty of this incredible, far-flung place. A Havasupai Falls Permit is required to enter the reservation, to make the 10-mile hike to Havasu Falls, and to stay in the canyon. These permits are checked at the only access point for the falls, the Havasu Falls Trailhead at Hualapai Hilltop. Only indiviudals with valid permits are allowed to enter. The Havasupai Tribe makes a limited number of Havasupai Falls permits available each year. These permits go on sale February 1st, at 8:00 a.m. and sell out quickly. Permits may be purchased either by visiting the tribe’s official website, or by calling the Havasupai Tourist Office (928) 448-2121. If you’ve heard rumors that it’s almost impossible to get through on the phone, it’s true! The office is teeny and the line gets flooded. So reaching a human is a matter of both luck and persistence. Plan to redial, redial and then redial some more. A Havasupai Falls Permit includes the fees for the permit, entry to the Havasupai Reservation, camping and taxes. Permits fees are calculated per person / per day, with a maximum 4-day-stay allowed on each permit. Havasupai Falls Permits are non-refundable and non-transferable, so trip insurance is recommended. Spring and Fall are the most popular seasons to visit Havasu Falls and sell out first. Once you are at the falls, you’ll be thankful you made the effort! If you prefer to visit Havasu Falls with a group tour, there are a number of companies that conduct guided tours into the canyon. Pre-purchased permits are included within the tour package price. These tours also sell out quickly. So be sure to make your reservations well in advance. Group tours generally include equipment rentals, mule transport of supplies, camp setup, food and cooking services, and guided hikes. The Havasupai Falls Campground is a beautiful, flat, mile-long stretch on the Havasu Canyon floor. A Havasupai Falls Permit is required to camp. The camping area starts just past Havasu Falls, 10-miles from the Havasu Hike Trailhead. It ends before the top of stunning 150′ Mooney Falls. Turquoise blue Havasu Creek babbles through the middle of the campground, while the high walls of Havasu Canyon frame the sides. The Havasupai Falls campground accommodates about 100-150 tents, or 200-300 campers. There aren’t designated camp sites. So permit holders set up in lovely nocks and crannies: under the ample shade trees, alongside the creek, by sandy pathways or below canyon walls. A few large clearings are generally filled by tour groups. Multiple picnic tables are scattered throughout the campground. And drinking water is available from a tapped fresh-water spring. There are regularly cleaned and supplied vault toilets at both ends, and in the middle, of the campground. Campers are required to take all of their trash out with them. If camping isn’t your thing, the quaint Havasupai Lodge is another option. This small, rustic lodge, with a central courtyard, is the only hotel in this remote location. 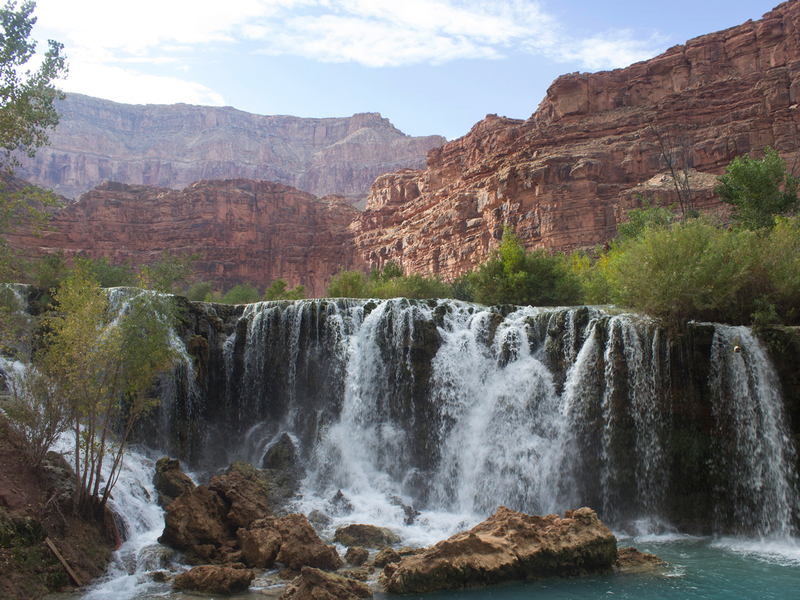 It’s located in Supai Village, 8-miles from the Havasu Falls Trailhead. The Lodge is 2 miles from Havasu Falls. It is air conditioned, with running water and basic electricity. There is no food available. So you will need to bring your own, purchase it at the small general store, or eat at the sporadically open local cafe. Reservations can be made by calling (928) 448-2111 or (928) 448-2201. The purchase of a Havasupai Falls Entry Permit is also required to stay in the Lodge. It is sold along with the room reservation. Note: In 2018, the Havasupai Lodge will be closed for renovations from Jan. 1 – March 31. The 10-mile hike to Havasu Falls is astoundingly beautiful! And a fantastic part of the experience. The Havasu Falls Hiking Trail starts at remote Hualapai Hilltop. It descends quickly in the first 2 miles, then continues gently downwards through Hualapai, then Havasu, Canyons. Click here for a detailed description of the trail. A private helicopter makes frequent trips between Haulapai Hilltop and the small landing pad in Havasu Canyon’s, Supai Village. It’s primary purpose is to carry supplies in and out of this remote village and provide transport to the Havasupai People. The helicopter flies Mondays, Thursdays, Fridays and Sundays, between 10:00 a.m. and 1:00 p.m. When space is available, it’s possible to pay to be flown in or out of Supai village, on a first come, first serve basis. Havasu Falls is the most recognized feature of Havasu Canyon. 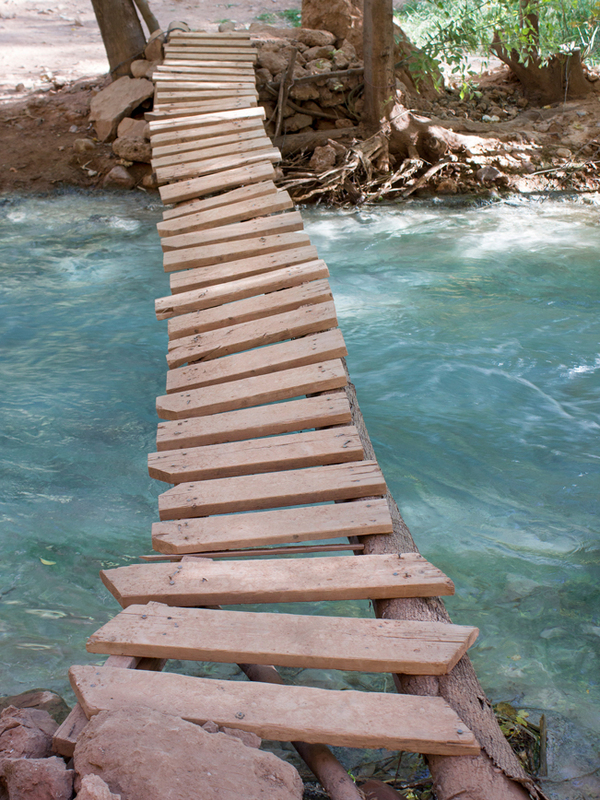 But spring-fed Havasu Creek is plush with seemingly endless cascades. Its turquoise blue waters crash first over impressive 50 Foot Falls, followed by Little Navajo, Havasu, Mooney and then Beaver Falls. There are tons of smaller cascades all along the creek’s course to the Colorado River. It is worth taking a few days to hike to, and explore, each of these stunning locations. Click here for details on the hike past Havasu Falls. Because of Havasu Trail’s remote location, many people choose to spend the night in the area before heading into the canyon. The three closest options are The Grand Canyon Inn, The Haualapai Lodge, or sleeping in a car or tent at Hualapai Hilltop. Both hotels are about an hour drive from the trailhead. A sliver of space behind the parked cars on Hualapai Hilltop can accommodate small tents. The final 60-mile drive to Havasu Falls Trailhead, on Indian Route 18, is both remote and beautiful! The fully paved road gently rolls through Hualapai Reservation ranch land, passing free roaming cows and horses. The road ends at the trailhead parking lot at Haulapai Hilltop. You can’t miss it! Further information on recommended supplies and more is in the works. Please check this post again for the link.